正面 自由女神坐在骷髅宝座上及文字"被屠杀者 元 Z 50 2019"
自由女神坐在骷髅宝座上及文字"被屠杀者 元 Z 50 2019"
1盎司Zombucks被屠杀者元银圆 The Slayed Dollar is the eighth round in the ten round Zombucks series. These rounds are designed to awaken the sleeping amongst us, and to save humanity from itself! 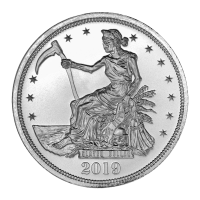 This round is a modern interpretation of the US Mint's Trade Dollar, minted from 1873-1885. On the Trade Dollar, Lady Liberty is holding an olive branch and sitting on bales of wheat and goods. The last 130 years have not been kind to Lady Liberty... The reverse side shows a bio-hazard symbol with blood splattered around it, reminding humans of the apocalypse hazards. The words "Zombucks Currency of the Apocolaypse" leave us in no doubt as to possible future usefulness of this round. The obverse features a starved and almost skeletal Lady Liberty, her bones visible beneath her skin. Her clothes are tattered and torn, and her face appears to be decomposing. She is holding a scythe as a representation of the toll the Zombie Apocalypse has taken on humanity. The year 2019 is the predicted date of the apocalypse with a denomination of 50 Zombucks, the currency of the zombie apocalypse. As with the rest of the Zombucks series, these rounds will be produced for a limited period of time.